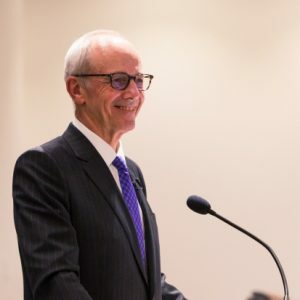 Judges should demonstrate “humility and humanity” when dealing with court cases involving Indigenous peoples, Ontario Chief Justice George Strathy, told a Faculty of Law audience at the Morris A. Gross Memorial Lecture. Speaking in the context of Canada’s ongoing reconciliation movement with its Indigenous population, Strathy said the wounds the residential school system inflicted on individuals and their families have to be taken into account by the courts. 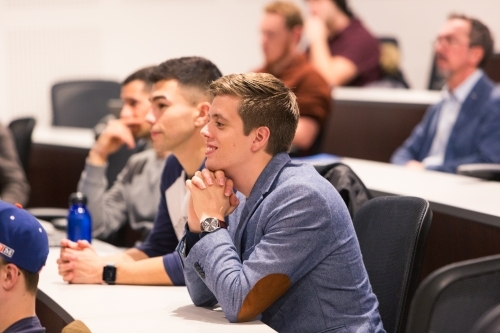 “I think both as a judiciary and a society, we have to have the humility to recognize what we’ve done wrong, and confront the issue, and recognize other people’s experiences and what they went through, and to engage in a respectful dialogue about how we can address the injustices of the past,” Strathy said at the Jan. 19th lecture. Embracing the “Gladue spirit” in criminal sentencing is part of that reconciliation, said Strathy, referring to a principle arising from a 1999 Supreme Court of Canada decision directing judges to consider non-custodial sentences as a way of recognizing the racism and discrimination faced by Indigenous peoples. “We have to look into the Indigenous experiences of the individual going back many generations, and to what brought the person before the court,” he said. Strathy said that approach ties into the virtues of humility and humanity which are important for every judge to have. The movement to rebuild relationships between Indigenous populations and the rest of Canadian society has been driven in large part by a 2015 report of The Truth and Reconciliation Commission documenting the scope and impact of residential school system abuses on generations of First Nations, Inuit and Métis children. Under the system, approximately 150,000 Indigenous children were forcibly taken from their families and placed in residential schools across Canada. Most suffered physical, emotional, and sexual abuse. The last of those schools closed in 1996. Many say the impact of that systemic racism and discrimination is illustrated in the disproportionate number of prison inmates who are Indigenous. While Indigenous peoples make up about four per cent of the Canadian population, they comprise almost 25 per cent of federal prison inmates. Strathy’s remarks came in response to a question by Cheryl Milne, executive director of the David Asper Centre for Constitutional Rights, which is sponsoring a series of lectures on Canadian constitutional law and human rights to mark the 150th anniversary of Confederation this year. A U of T law school alumnus who was appointed chief justice in 2014, Strathy said one of the greatest challenges for the judiciary has always been balancing the virtues of courage with restraint, so they know when to act, and when to stop from going too far. Strathy cited several landmark decisions handed down by former Supreme Court of Canada Justice Ivan Rand, a celebrated jurist whose biographer says held deeply bigoted views about French Canadians and Jehovah’s Witnesses, among others. Yet in the 1950s, Rand struck down a Quebec City municipal bylaw restricting the rights of Jehovah’s Witnesses to distribute religious materials, and also wrote a decision against the provincial government’s attempt to close buildings used by communists. 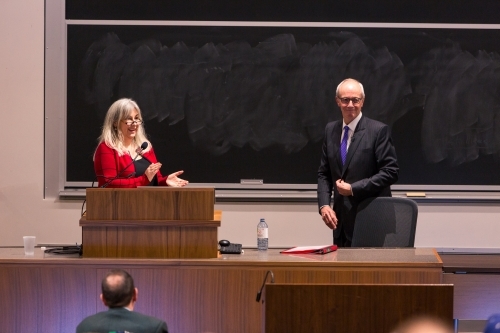 Asper Centre Executive Director thanks Ontario Chief Justice George Strathy after his lecture. The ability of judges to set aside prejudices and guard against their own beliefs from colouring their decisions has become even more important since the enactment of the Charter of Rights and Freedoms as part of the Constitution Act of 1982, he added. While pre-Charter judgements sometimes impacted civil rights “incidentally” as a matter of common law, the modern constitution gives courts the express responsibility to strike down laws they determine violate the Charter. Sometimes the courageous thing to do is resist public pressure and political consequences, said Strathy. In a famous ruling made by former SCC Justice Peter Cory—for whom Strathy worked while attending U of T when Cory was in private practice—he threw out a case against four accused, ruling their Charter rights had been violated because they had been forced to wait almost two years before going to trial. Thousands of charges in other cases were subsequently dismissed or withdrawn in the early 1990s as a result of Cory’s ruling. When considering Charter issues, Strathy said he thinks judges are best served by restricting their deliberations to the narrowest scope of the law regarding the case in front of them. “The Charter expects more of judges, and in return it gives them unprecedented authority with respect to legislation,” said Strathy. By the same token, deferring too much to politicians and legislatures can be a vice if it leads to the infringement of rights and freedoms. Sitting on a three-member panel, he wrote a judgement striking down a portion of The Truth in Sentencing Act on the grounds it violated the Charter, essentially dealing a blow to the Conservative government that had just appointed him. In response to a question by the Faculty of Law’s Dean Ed Iacobucci, Strathy says the 30 judges in his court do not worry about whether their cases will be appealed to the SCC, nor do they give any influence to the “notwithstanding clause,” which gives Parliament and provincial legislatures the authority to override portions of the Charter. Answering a question by Toronto lawyer and U of T law school alumnus Gavin Magrath, Strathy made it clear that he feels judges have to be able to change with the times. This entry was posted in Events and tagged Chief Justice George Strathy, Judges, Lecture, Morris A. Gross Memorial Lecture. Bookmark the permalink.